In the previous post, we had started this amazing journey of understanding and implementing Persuasion Techniques for Entrepreneurs. As discussed, persuasion is a combination of art and science, wherein we use psychological tactics and techniques to put across our point of view in a positive manner, thereby convincing the other person to be on the winning side. Before we further embark into this discovery of mind-altering techniques and tactics to influence other person’s views and thinking, we should stop for a second, and understand the evil sides of this ‘skill’ as well. Persuasion Techniques can be compared with dynamite: It can literally catapult an entrepreneur into achieving greatness and everything he or she desired at any point of time. But just like dynamite, this skill can be used for destruction as well. There is a thin line dividing good from evil, and being the practical user of this technique, it becomes imperative for you to accept both the implications and side-effects. Let us go through one hypothetical situation: Your company has recently hired an expensive developer/programmer, who is paid 3 times the average salary of other old-timers. While interviewing him, you used all the persuasion techniques available with you (which we will share as we progress) and convinced him that your company is the greatest workplace in the world. After a week, all of a sudden, the project for which he was hired has been pulled-off by your client, and now you are wondering what to do with this expensive and skilled programmer. You call him into your cabin, and try to explain the situation. Using persuasion techniques, you give him the hint that he is not required here, and he can leave. But he says that he has left the previous company on the promise that you will continue working with him, and his family depends on your decision. What can do you do here? Will you use the persuasion technique to kick him off the company or you will use the same techniques to bring on additional projects and try to retain him? In several literatures and guides, Persuasion has been classified as ‘evil’. Some researchers have described persuasion as an ‘evil’ mechanism to ‘manipulate’ or ‘influence’ the other person to behave in the way you want. Gaining ‘mental control’ of the other person, ‘brainwashing’, ‘malignant use of brain dynamics’ etc are some other negative terms associated with this Art & Science of Persuasion. No, I won’t deny that. Just like dynamite, persuasion techniques are powerful and immensely effective way to literally manipulate and control the other person. But just like dynamite, it can be either used to blast rocks to build bridges or blast the bridge itself. At the end of the day, you as an entrepreneur / CEO / Manager needs to take the call of ethics and morality to use this skill in the most optimistic manner, who doesn’t harm anyone. As I have emphasized earlier, the goal of persuasion is that at the end of the negotiation, both the parties are on the winning side. In very simple terms, persuasion is understanding the social triggers, delving deep into the functioning of the mind (your as well others) and then taking steps which end up into a win-win situation for all. Another hypothetical situation: You are selling brand new mobile phones, which are directly imported and are of high configuration. Your targeted audience comprises of high net worth individuals, who don’t mind shelling out 50,000 bucks for a new phone, every 6 months. Prestige is more important to them than money. And you understand that. Now, a lady comes in with her kid, and asks you to show her some top of the line smartphones, which her child can also use. She is looking wealthy and you know that she can spend. You really want her to buy that top of the line exclusive iPhone but you also know that her kid wont be able to handle that. A lower segment Android can work for that child well, until he grows up and understand mobile better. Heck, you even think of telling her that her child may be better off without a mobile. Use the persuasion technique to sell her the biggest and the costlier smartphone to make quick commissions or you will persuasion techniques to convince her that her kid doesn’t need a mobile or a cheap mobile can work for him? A person who understands how mind works and how desire sometimes makes us blind will be able to manage the situation in a better way, compared to a greedy person who will anyways make his killing. Remember the moral science teacher in your school who used to say that moral and ethics is a subjective matter, depending on who is more happy? 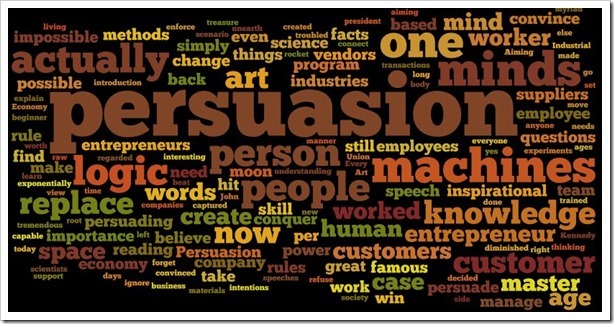 Yes, persuasion techniques can be described something similar. I will leave it to you, the entrepreneur, to decide how to optimally use these techniques. As a general rule of life in general, no person in the Earth can remain happy by making the other person unhappy. And the same rule can be applied in business and management as well. In the next chapters, we will delve deep into the strategies, techniques and methodologies, which will make you an expert in Persuasion & Influence, and we hope that the skills would be used to make the world a better place.